Ocean Outfitters has been a carbon neutral company since offsetting our first footprint in 2015. This means each year we: measure our greenhouse gas emissions to understand our impact; work to reduce the emissions as much as possible; and that we offset our annual emissions by contributing to projects that prevent the equivalent amount of emissions. We chose to offset our footprint with Offsetters, Canada’s leading carbon management company. 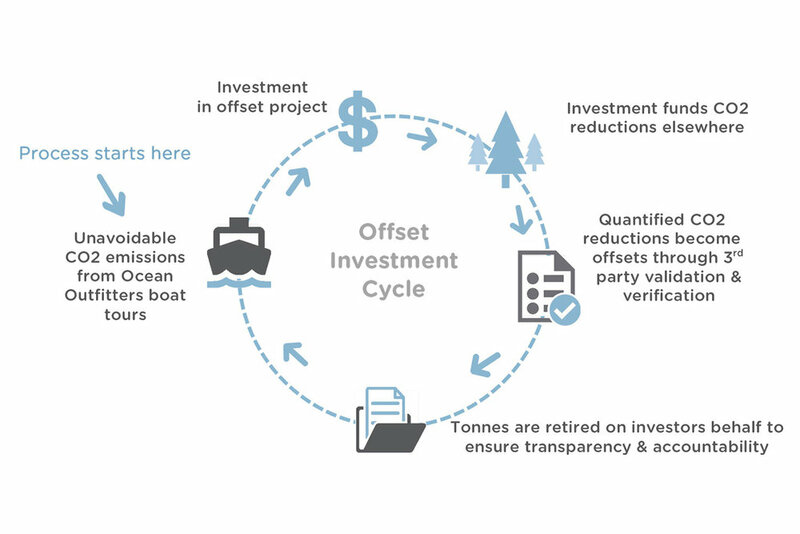 Offsetters’ offset projects are verified and validated by third parties to ensure that the emission reductions are real, additional and permanent. By supporting their projects, we prevent the equivalent amount of greenhouse gas emissions that we emitted—neutralizing our climate impact. The Great Bear Rainforest is home to the largest intact coastal temperate rainforest remaining in the world. The resources of the Great Bear are vast and valuable to Coastal First Nations, environmental groups, forest companies and governments. Together, these groups have adopted an Ecosystem Based Management approach that values the forest not as a source of lumber alone, but as a balanced system that sustains biodiversity and an enriched community. Funds from the sale of carbon offsets go towards creating jobs within the First Nations Communities in the Project area. By creating a conservation economy that puts a dollar value on carbon absorption, funds are returned to the original stewards of this land. With their lush valleys, rugged peaks, tumbling creeks and deep lakes, British Columbia’s Selkirk Mountains are both astoundingly beautiful and ecologically important. Spreading across 136,000 acres, the project lies in the heart of this incredible mountain range. It harbours a wide variety of habitats, including old-growth forests, alpine tundra, tumbling creeks and the deep, cold waters of Kootenay Lake. A plethora of plant and animal species utilize these habitats, and the conservation of the area is critical to ensuring their long-term viability. the government to purchase the site.